Astronomy and biomedical sciences find common roots in their need to process acquired data into interpretable signals or images. In these applications of signal processing as for virtually all others, the complexity of data to be acquired and processed is constantly increasing, thus challenging signal processing theories. Data indeed come in larger volumes every day, can be multi-modal (referring to multiple imaging modalities), multi-spectral (referring to multiple imaging frequencies), scalar or tensor-valued (as polarization signals), living in high dimensional geometries, possibly non-Euclidean or discrete (as signals on the sphere or on graphs), etc. As matter of fact, the astronomical and biomedical sciences communities are almost completely disconnected. Fostering contact and creating collaborations between these communities can shed new light on the problems of interest in each community and promote common research approaches for similar signal processing issues, thereby paving the way to new scientific advances. The international BASP Frontiers workshop was created to promote synergies between selected topics in theoretical, astronomical, and biomedical signal processing. Among a myriad of other themes of potential interest, radio interferometric imaging and magnetic resonance imaging (MRI) are techniques of major importance today, which will also be driving the future of astronomy and biomedical sciences respectively. Both these imaging techniques are currently facing fascinating signal acquisition, reconstruction and processing challenges, which are concisely described in the next paragraphs. Aperture synthesis in radio interferometry is a powerful technique in radio astronomy, allowing observations of the sky with otherwise inaccessible angular resolutions and sensitivities. 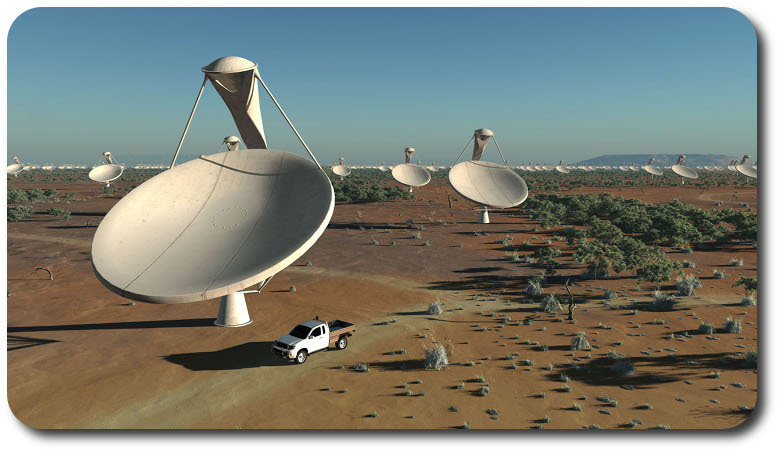 With new international projects under construction and design, notably the Square Kilometer Array (SKA, see left Figure, Image courtesy SPDO/Swinburne Astronomy Productions) whose science goals range from cosmology or astrobiology to strong field gravity, it also represents a significant part of the future of radio astronomy. Future telescopes will have to consider wide-band (i.e. hyper-spectral) polarized imaging on wide fields of view on the celestial sphere. In this context, imaging techniques for radio interferome try literally need to be re-invented, thus triggering an intense research in the field. MRI is a non-invasive and non-ionizing biomedical imaging technique that finds its superiority in both the flexibility of the data acquisition process and the multiplicity of its contrast mechanisms. This technique is used for everyday diagnosis, but also enables scientific advances, for example in neuroscience. However, the rather long acquisition times inherent to the technique currently act as an important limiting factor for many applications, notably for modalities relying on more dimensions than the spatial dimensions, such as diffusion and functional, or dynamic imaging. Accelerating the acquisition procedure therefore appears as a main challenge in the field. 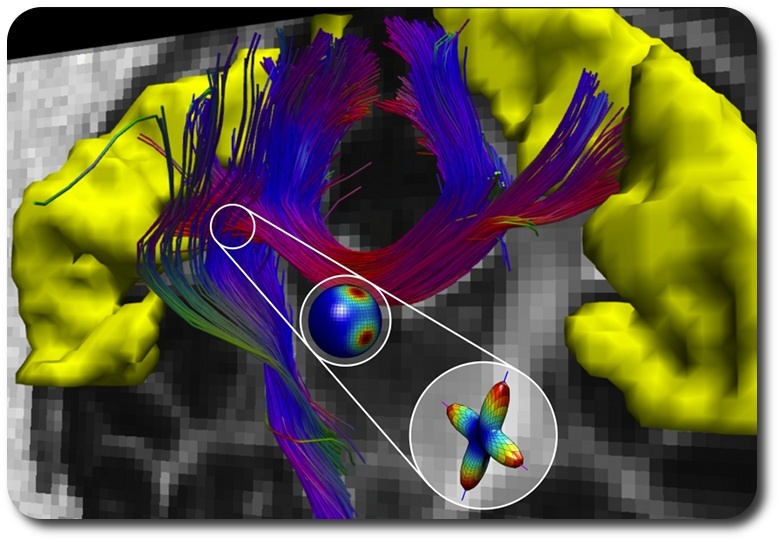 For example, drastic accelerations are required to enable high angular resolution diffusion imaging, and subsequent mapping of neuronal fiber tracks in the brain (See Figure on the right). Radio interferometry and MRI are apparently orthogonal research fields but they actually share the same Fourier data acquisition procedure, so that each field may strongly benefit from a multi-disciplinary approach. As far as theoretical signal processing is concerned, recent evolutions related to wavelet techniques and compressive sampling, building on the notion of signal sparsity have now pushed the frontiers of sampling, reconstruction, and processing beyond the classical limits set by Nyquist, Wiener, and others. As a flagship example, the theory of compressive sampling demonstrates that for sparse signals a small number of random measurements of the order of the signal sparsity will suffice for an accurate and stable reconstruction. An ill-posed inverse problem is thus defined for signal reconstruction (See Figure on the left). The theory also relies on the field of optimization, which provides a whole jungle of reconstruction algorithms regularizing the inverse problem with very versatile (sparsity) priors. Sparsity represents a very active field of research, both at the theoretical and algorithmic level, and with applications in many fields, including astronomy and biomedical sciences, and in particular for radio interferometric imaging and MRI. In this scientific context, the first edition of the international BASP Frontiers workshop, in 2011, gathered more than 50 international experts around the selected topics of MRI and radio interferometric imaging, and their common issues for data acquisition and signal reconstruction. The scientific and clinical challenges underpinning these imaging techniques were largely emphasized. In the wave of the success of the first edition, the 2013 workshop will concentrate on the themes of sparse signal sampling and reconstruction, for radio interferometry and MRI, but also open its floor to many other interesting hot topics in theoretical, astrophysical, and biomedical signal processing. Biomedical imaging modalities such as multiwave imaging, ultrasound imaging, CT, PET, OCT, etc. will be discussed. Astronomical techniques such as optical interferometric imaging will also be studied. All these state-of-art techniques face similar inverse problems for imaging as those encountered in radio interferometry and MRI. Beyond imaging techniques themselves, major signal processing issues relating to signal denoising, deconvolution, component separation, and multi-modal processing to quote only a few will also be discussed in the context of major astronomical and biomedical applications. For illustration, mapping the cosmic microwave background and weak gravitational lensing signals represent timely laboratories for these issues in astrophysics and cosmology.